According to the World Bank, the Democratic Republic of the Congo is currently the world’s poorest nation with GDP per capita in constant 1990 PPP dollars of $766 in 2012. This makes today’s average Congolese citizen about 34% richer than the average Roman in 14AD. 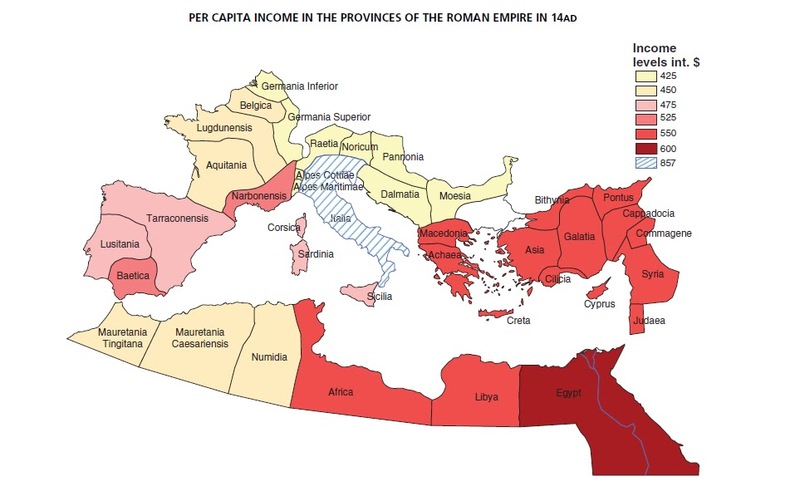 However, as the map above shows GDP per capita varied widely across the Empire. In Italia, the core of the Empire in 14AD, average GDP per capita is estimated to have been as high as $857, making it actually higher than Congo’s today. This was caused, in part, by the fact that taxation tended to flow from the periphery to the centre and the concentrations of the Empire’s elite citizens living in or near Rome. In contrast, the Empire’s poorest provinces were only half as wealthy, which dragged down the average. Interestingly, this relative income inequality between Roman provinces is similar to that seen between US states today. According to the United States Bureau of Economic Analysis, Delaware has the highest GDP per capita of any state at $61,183 in 2012 vs Mississippi’s much smaller $28,944 or just a little less than half as much. However, Washington DC’s figure of $145,663 is five times that of Mississippi’s. So how is it possible for citizens of today’s poorest countries to be, on average, wealthier than the citizens of one of history’s greatest empires? Independence: Most states that were part of Empires have decolonised and are today de jure independent, meaning they don’t need to pay money directly to a foreign occupying power. However, debt for many countries remains a major issue. End of Slavery: While slavery still happens far too often in the world today, it is illegal in all countries. In contrast, the Roman Empire was at its very core a slave state, with slavery playing an important role in the economy. However, neither of these are fully sufficient to explain the wealth differences between today’s global poor and those of Romans living 2,000 years ago. Two other changes are more important. Science & Technology: The first factor is the vast improvements in science and technology over the past 2,000 years. While the Romans were able to build engineering marvels such as roads and aqueducts, they wouldn’t have a clue what to do with a mobile phone. And the speed of technology’s diffusion is increasing. For example, Zimbabwe (the second poorest country according to the World Bank) has more mobile phones than people. Combine this with vast improvements in agriculture over the past 2,000 years and even the world’s poorest economies have far more productive workforces than Rome did. Health: Life Expectancy in the Roman Empire has been estimated to have been as low as 25 years, due in part to extremely high infant mortality rates that might have been somewhere between 15-35%. Today, Sierra Leone has the world’s lowest life expectancy at 38 years and Afghanistan has the the worst infant mortality rate of somewhere between 14-19%. So even people living in countries with the worst health stats today, are statically likely to live longer, and see a greater share of their children reach adulthood, than a Roman would in 14AD. Nevertheless, that’s not to say each of us couldn’t be doing more to help by donating to humanitarian organizations like the Red Cross and Doctors without Borders. You may also be wondering how on earth you calculate and compare GDP per capita figures from 2,000 years ago? The numbers for the map come from historian Angus Maddison who uses Sestertius records to find wheat equivalent figure for national disposable income and makes comparisons based off that. It also assumes the population of the Empire in 14AD was 44 million (other estimates have it as high as 60 million), so is at best just a very educated guess. The Roman Economy Wikipedia page has more on this. It is interesting to note that outside of Italia, Egypt was the wealthiest province of the Empire and the areas that make up modern France were some of the poorest. In terms of GDP per capita of these 3 regions today, France is the wealthiest ($40,375) followed by Italy ($35,486) with Egypt ($10,877) only roughly a quarter as well off as France (but 16X wealthier than it was 2,000 years ago). Made it this far? 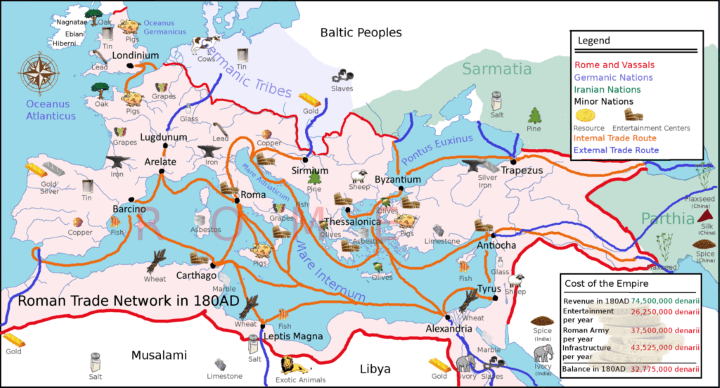 Here’s a bonus map looking at the various trade routes within the Roman Empire in 180AD to give you a better idea about the types of goods and resources each part of the Empire produced and perhaps help explain why some were richer than others. This is interesting as a historical resource, but any comparison to today is downright silly. Many people in the Roman Empire were sustenance workers who never entered the economy at all. However, if you took the HDI for metropolitan free citizens in the Roman Empire and compared that to today, it would be at least a medium level of development. The analysis of the U.S. is flawed — purchasing power differences greatly reduce the inter-state inequality. The U.S. has much lesser geographical inequality than most European nations. I should say, in Hispania (Spain), Barcino (Barcelona), if existed at that time, was just a very small town. Biggest cities were Tarraco (Tarragona), Cartago Nova (Cartagena) and Gades (Cadiz). Later Emerita Augusta (Merida), CaesarAugusta (Zaragoza) and Hispalis (Seville). I would have compared the lifestyle, not the GDP. The wealth and welfare available in Italia at that time was much higher compared to any of today’s countries. Also, the rest of the non-roman world had basically no GDP at all. If you compare the first decade of the twenty first century to the Roman Empire, in terms of production (industry), medicine (science), and engineering (most of our cities have got vastly healthier since the nineteenth century) we vastly outweigh the RE in this regard, so this must make an economical impact in comparison. In terms of the core land of Italy (and Rome), modern Italy is immensely better off for every Italian (economically & politically) than under RE. Even pollution was not good under the RE. There is an ice core spike in the metal lead found about 100BC to 400AD (roughly classical period), due to intensive Roman smelting of lead, mainly supplied by the Spanish lead mines. Per capita income includes the slaves or not? You are missing that the $570 is in 1990 dollars… Using 1990 dollars there are several countries with lower GDP per capita than that today. What you’ve written above ignores inflation.